Boeing, Boeing—the name of an airplane, the name of a play. However, there isn’t even a plane or a scene on a plane in this classic farce, written by French playwright Marc Amoretti. The English language adaptation was first staged in London at the Apollo Theatre in 1962 and transferred to the Duchess Theatre in 1965, where it ran for a total of seven years. In 1991, the play was listed in the Guinness Book of Records as the most performed French play throughout the world. May River Theatre chose to close its season with this broad comedy, which all boils down to juggling timetables and a reliable maid who never forgets to change the photographs of three stewardesses who are all engaged to swinging bachelor Bernard, without knowing about each other. Bernard’s perfect life gets bumpy when his friend Robert comes to stay and a new and speedier Boeing jet throws off all of his careful planning. Catastrophe looms when all three stewardesses are in town simultaneously. Taking the helm as director is DA Southern, who was last seen on stage in last November’s Curtains and last season in Smoke on the Mountain. May River’s cast of six, includes four veterans and two newcomers to the MRT stage. Playing the role of Bernard is veteran J.T. Chinn, last seen in The Miracle Worker. Veteran Rob Tillison plays Robert, who was last seen in Man of La Mancha. Mary Lynn Finn graced the MRT stage in Curtains and will play the Italian stewardess Gabriella. The German stewardess, Gretchen, is being played by Maggie Cunningham, who appeared in Young Frankenstein. The role of the American stewardess, Gloria, will be played by newcomer Cate Mengel; also new to the MRT stage is Barbara Fiscarel as Berthe, the maid. 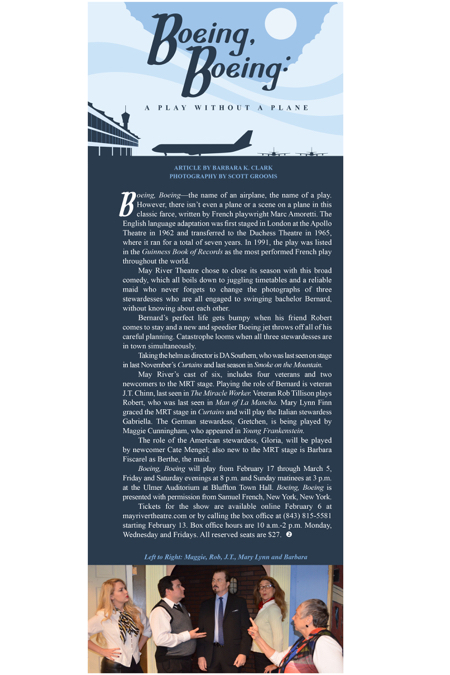 Boeing, Boeing will play from February 17 through March 5, Friday and Saturday evenings at 8 p.m. and Sunday matinees at 3 p.m. at the Ulmer Auditorium at Bluffton Town Hall. Boeing, Boeing is presented with permission from Samuel French, New York, New York. Tickets for the show are available online February 6 at mayrivertheatre.com or by calling the box office at (843) 815-5581 starting February 13. Box office hours are 10 a.m.-2 p.m. Monday, Wednesday and Fridays. All reserved seats are $27.